Ecta doesn’t look so bad. This isn’t even the first time I drew Derk or Lorelei, but the first time I drew them where they at least have the same outfits as they do today, although they look terribly off-model from who they’ve become. The Skärvas are some of my earliest drawings of him, but not the first. My very first concept art of him is the holy grail. I didn’t put it up here because it’s so bad, we’re saving it for a special occasion. He just looks so different, and through practice at drawing him he evolved naturally into what he looks like today. You’ll see it.. someday. Our mindset for Frozio: “The guide should be a penguin.” I draw a penguin in five seconds. “He should have a bowtie and a top hat.” Added. And there you go. Also that drawing of the Third has been around since the summer. Man I’ve been looking forward to his entrance for a LONG time… in which I could think over his design more. Anyway, these sketches are awesome! I always love seeing how characters looked like before their final design. I’m so sorry for not commenting a lot lately… again D: I’ll remind myself to comment more often ‘cuz I feel like such a jerk for not doing so. I’m still looking forward to more of it, my friend! And hey, I for one enjoy your DKC obsession. Thanks, and hey, don’t worry about it! Comments always delight us, but I know you’re still going to follow us, so don’t beat yourself up about it. I like the angry Ecta there, looks very malevolent. And I see both past and present Thirds are digging their tri-brows! Thanks! I’m sure you’ll see her get that angry at some point, and it’ll probably involve Davis. You think she’s been furious before – nah, that’s just her getting ticked off, relatively. And good luck with the play! I hope it goes well! Thanks! It did – it was a wonderful opening night! To be fair, Derk went through a LOT of revision. He was actually quite hard for me to design. But when I got an outfit for him, I also got down his body type and hair at the same time, essentially. Unfortunately – or fortunately for me, actually – most of my earliest sketches of Derk were on paper and they’ve been lost. He did have pupils at one point. Their disappearance, and his weird mouth, were Victor’s suggestions. I’m glad for them. I really like the drawing of The Third, by the way. Thanks! Yeah, III’s old design definitely wasn’t bad and hasn’t really changed all that much. I like his current hair though, it’s more… dynamic? 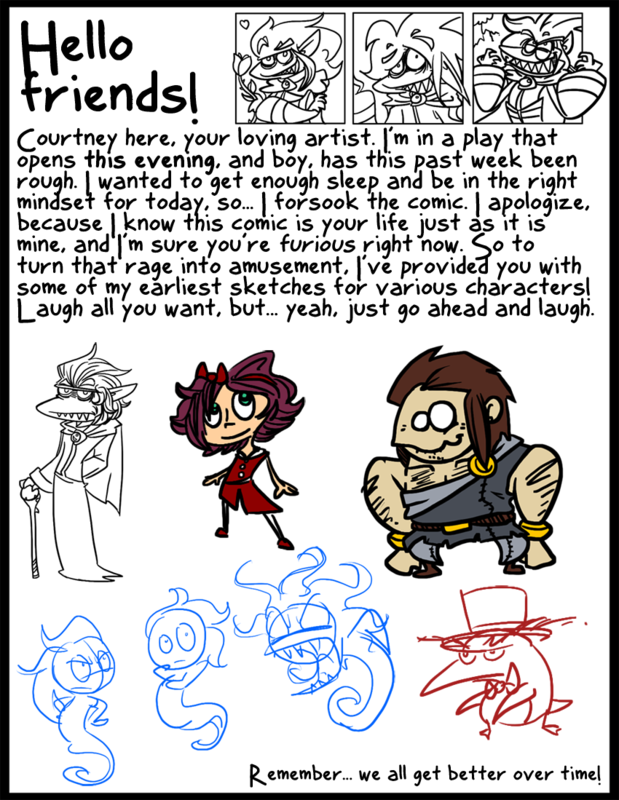 Hahah, that very drawing became the basis for that panel in comic 18, remember? “My most powerful charm – my devilish good looks”? Or are you disturbed because he doesn’t quite look like himself there? Those three drawings are from a set of 25 expressions I did for him as part of a really useful (necessary, I might even say) practice activity. They were the first 25 drawings I did for him after my original concept art and another really dated sketch. In the process of that expressions sheet, he naturally evolved into where he was by the first comic. The expressions are “flirty,” “drunk” and “triumphant” respectively. Out of order, of course. I don’t think Skärva is ever going to experience triumph after being flirty. Laugh? Come now, they aren’t that bad! I really like the way the Third looks, as well as the third Skaerva face from the top, which I will hereafter refer to as his “Victory Face.” And PLEASE tell me that Ecta face will be in the comic! She’s becoming one of my favorites, and it would be awesome to see her snap like that! The only one that’s really laugh worthy is that Frozio… just.. yea I’ve said enough. Yeah, I could tell you liked her by your avatar I’ve grown to love Ecta very much too. I know she just seems like she has serious issues right now, but there are reasons for that, and I’m looking forward to exploring her character over time. I also really enjoy drawing her – she’s very fluid and I feel like I can have a lot of freedome with her – and she’s my easiest character because once I have her, it’s just a single kinda-transparent white fill and then BAM. done. Not quite yet, but soon. Soon. Lol at Skarva holding roses and slowly descending into maniacal glee. … Derk is still adorable. It’s hard to imagine a time when he wasn’t adorable, but I know some of my earlier sketches were like wtf and I think I “lost” them on purpose… I can’t quite remember what I did with them… probably threw them into Mount Doom. week before opening show? we called that hell week at my school. such horrible fun. Indeed. This particular play, which was a glorious mess right up until opening night, we had a rehearsal until like 2 a.m. or something? With beer. It actually benefited us a lot.